focus on a specific example app that takes things a little further than the others. Alongside the obvious use in creative narrative writing, the comic format can be utilised by many areas of study. Anything we do in life can be seen as a narrative and the comic is a great way to both summarise and reflect on any experience. Why do they work with kids? It is tempting to think that whether you like it or not, a combination of the internet, TV, Computer games and mobile devices has made the current young people heavily rely on visual presentation and images in general. But this is not a new phenomenon. 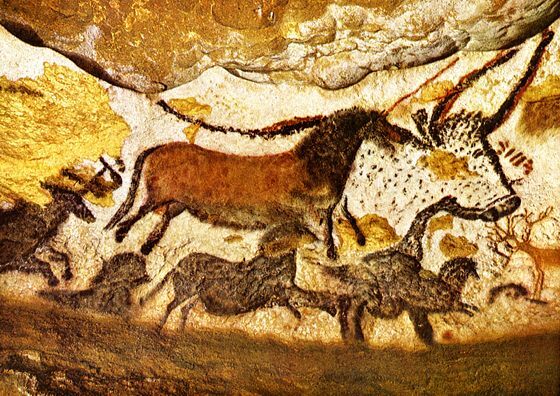 As Mr SAMR has highlighted, humans have always found the most success and progress when tools allowed for visual representation and story telling. They have also always had a desire and practical need for using visuals before text. Only for young kids? … No. Just for English and creative writing class? … No. A good way for teachers to move away from front-of-class presentation and have the students engage with content individually. Taking it to the next level. Which app? 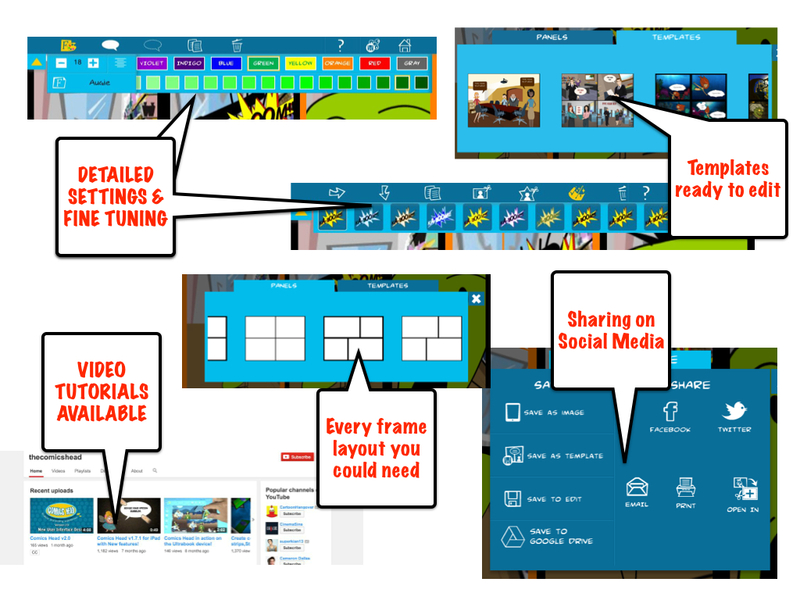 I thought I’d mention one app as it works well with all ages and especially caters for the older kids looking at producing more professional graphic novel level material. The app I like the most is Comics Head. 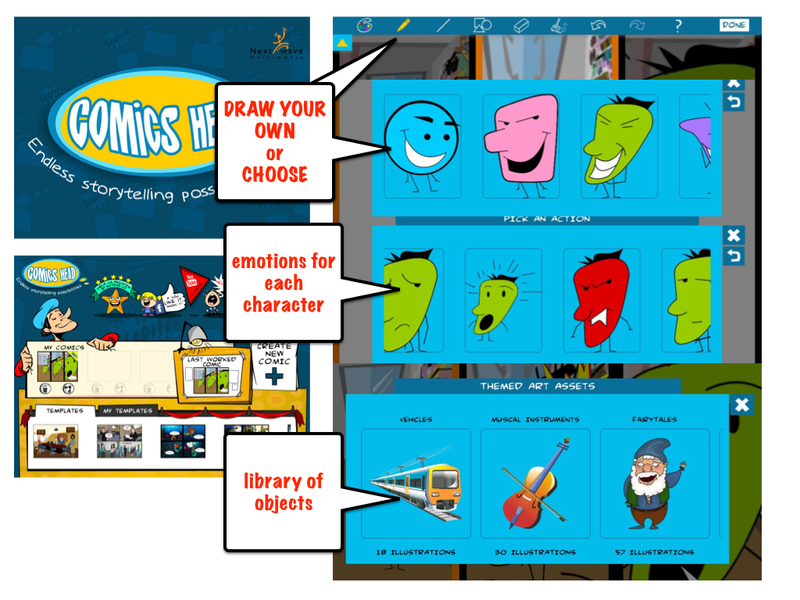 It is the Explain Everything of comic apps. It has every option imaginable, whilst being easy to use and publish with. Choose from a massive library of characters and objects. Full suite of editing tools. For the students who get serious about comics or to give every option needed when recording/teaching a process or event, Comics Head is great fun to use and hasn’t the restrictions of other comic apps. Many teachers would benefit from opening up to the use of comics as a format that definitely engages students in dealing with any kind of content.